a network or tangle, chiefly of veins or nerves; see also rete. adj., adj plex´al. plexus basila´ris a venous plexus of the dura mater located over the basilar part of the occipital bone and the posterior part of the body of the sphenoid bone, extending from the cavernous sinus to the foramen magnum. brachial plexus see brachial plexus. cardiac plexus the plexus around the base of the heart, chiefly in the epicardium, formed by cardiac branches from the vagus nerves and the sympathetic trunks and ganglia, and made up of sympathetic, parasympathetic, and visceral afferent fibers that innervate the heart. carotid p's nerve plexuses surrounding the common, external, and internal carotid arteries. cervical plexus a nerve plexus formed by the ventral branches of the first four cervical spinal nerves and supplying the structures in the region of the neck. One important branch is the phrenic nerve, which supplies the diaphragm. choroid plexus infoldings of blood vessels of the pia mater covered by a thin coat of ependymal cells that form tufted projections into the third, fourth, and lateral ventricles of the brain; they secrete the cerebrospinal fluid. coccygeal plexus a nerve plexus formed by the ventral branches of the coccygeal and fifth sacral nerve and by a communication from the fourth sacral nerve, giving off the anococcygeal nerves. cystic plexus a nerve plexus near the gallbladder. dental plexus either of two plexuses (inferior and superior) of nerve fibers, one from the inferior alveolar nerve, situated around the roots of the lower teeth, and the other from the superior alveolar nerve, situated around the roots of the upper teeth. lumbar plexus one formed by the ventral branches of the second to fifth lumbar nerves in the psoas major muscle (the branches of the first lumbar nerve often are included). lumbosacral plexus the lumbar and sacral plexuses considered together, because of their continuous nature. lymphatic plexus an interconnecting network of lymph vessels that provides drainage of lymph in a one-way flow. An example is the lymphocapillary vessels, collecting vessels, and trunks. myenteric plexus a nerve plexus situated in the muscular layers of the intestines. nerve plexus a plexus composed of intermingled nerve fibers. 1. in the male, a plexus of veins from the testis and the epididymis, constituting part of the spermatic cord. 2. in the female, a plexus of ovarian veins draining the ovary. sacral plexus a plexus arising from the ventral branches of the last two lumbar and first four sacral spinal nerves. solar plexus see solar plexus. tympanic plexus a network of nerve fibers supplying the mucous lining of the tympanum, mastoid air cells, and pharyngotympanic tube. A neural network on the promontory of the labyrinthine wall of the tympanic cavity, formed by the tympanic nerve, an anastomotic branch of the facial, and sympathetic branches from the internal carotid plexus; it supplies the mucosa of the middle ear, mastoid cells, and auditory (eustachian) tube, and gives off the lesser superficial petrosal nerve to the otic ganglion. Ludwig L., Danish anatomist, 1783-1843. Jacobson anastomosis - a portion of the tympanic plexus. Jacobson reflex - flexion of the fingers elicited by tapping the flexor tendons over the wrist joint or the lower end of the radius. 1. of or pertaining to the tympanum. 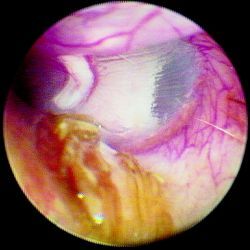 a thin, semitransparent membrane, nearly oval in shape, that stretches across the ear canal separating the middle ear from the external acoustic meatus (outer ear); called also the eardrum. It is composed of fibrous tissue, covered with skin on the outside and mucous membrane on the inside. It is constructed so that it can vibrate freely with audible sound waves that travel inward from outside. The manubrium (handle) of the malleus (hammer) of the middle ear is attached to the center of the tympanic membrane and receives the vibrations collected by the membrane, transmitting them to other bones of the middle ear (the incus and stapes) and eventually to the fluid of the inner ear. the membrane enclosing the fenestra cochlearis; called also Scarpa's membrane.